Ahhh, pizza. Who doesn’t love your thin crust, your melted cheese, and all of the wonderful toppings that are piled upon you? Pizza is so loved that you can get it almost anywhere in the world with any topping you can imagine. This flatbread is the perfect vehicle for just about any topping you desire. From the common Italian marinara and mozzarella to the more creative Brazilian chocolate and banana, pizza is a world traveler that does not discriminate. While I like experimenting with foods, I prefer to stick to the basics with pizza: marinara, mozzarella, and basil. The base of the pizza, the dough, has probably as many variations as the toppings that are layered upon it. Different cultures and regions claim their recipe is the best. The same goes with how the dough is prepared. 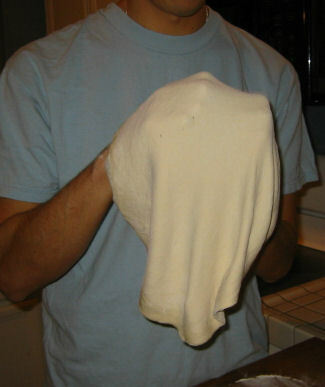 The dough is sometime rolled out, stretched by hand, or my favorite, thrown into the air. When I attended culinary school, I found that throwing the dough actually had a purpose (other than just plain fun). By throwing the dough into the air with a circular motion, you actually help stretch the dough out symmetrically into the all-important pizza shape. While the same results can be achieved by rolling out the dough and stretching it by hand, it just isn’t as satisfying as throwing the dough in the air, especially if you have guests over to watch the theatrics. If you have a pizza stone, now is probably the best time to put it in the oven. Mix yeast, water, honey and sugar in the bowl of a mixer and let stand for about five minutes until the mixture starts to bubble. Add olive oil, salt, and all but a few handfuls of flour in the bowl and mix with the dough hook. Adjust the consistency with the extra flour, scraping down the sides as you go. The dough is ready when it is smooth and elastic and comes away from the side of the bowl. Remove from mixing bowl, form into a ball, and place in a lightly oiled bowl. Let rise until doubled in volume (about 2hrs). Punch down, reshape, and let rest in refrigerator overnight. This step isn’t absolutely necessary but it helps develop more flavorful dough. Divide the dough in half and form circles about 30cm in diameter. Top with your favorite ingredients. Bake directly on pizza stone for about 10min or until the crust is browned and cheese is melted.